This easy Baked Coconut Shrimp Recipe is gluten free, and comes together with minimal ingredients! The perfect healthy party appetizer – it will be a hit for sure! I serve these with my Chili Orange Dipping Sauce, but cocktail sauce or a sweet Thai chili sauce would also pair well. Are you ready for all the upcoming festivities this month? If you’re entertaining, putting together a healthy party spread is not too difficult. When I’m planning a gathering, I always start with planning what drinks to serve. Cocktails are fun, but let’s face it — you don’t want to spend your whole evening bartending. Sparkling wines add a festive air to any party, are elegant, and are crowd-pleasers. Sparklings also pair well and a wide variety of easy-to-serve party foods. 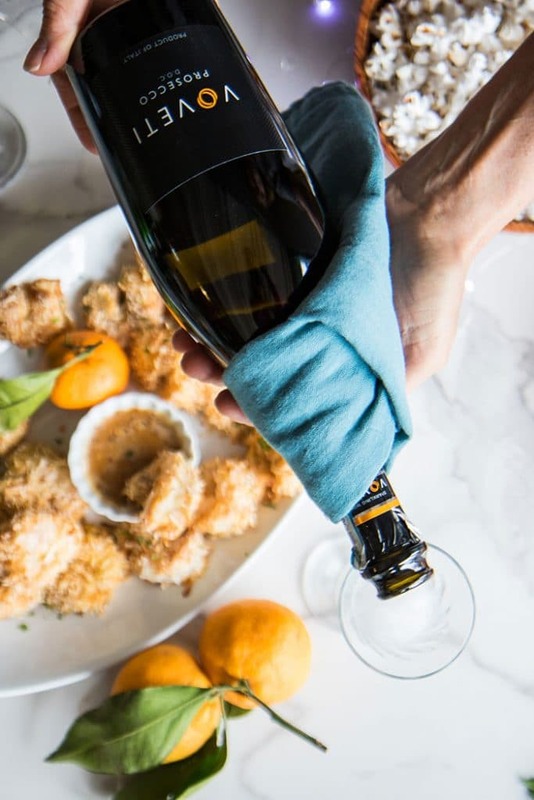 Plus — sparkling wines are wonderful on their own, no need to add sugary juices or syrups, so it limits additional calories (important, during a season where indulging is the norm!). 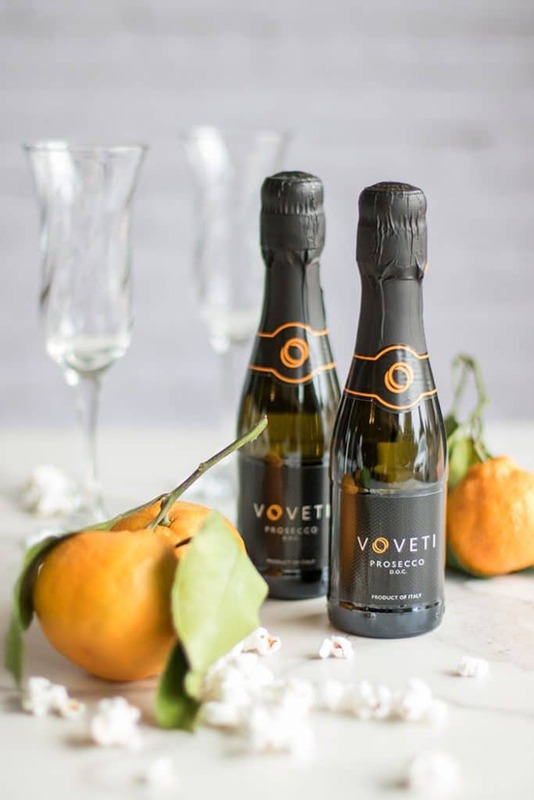 Recently, I stumbled upon VOVETI Prosecco – an easy drinking Italian sparkling wine. It’s a brut style DOC with tempered acidity – fresh and light. It was the perfect wine to serve with the coconut shrimp I’ve been wanting to make, and perfect alongside a few salty snacks as well. Parties don’t have to be calorie and sugar land-mines to be full of tempting and delicious food. Try these simple ideas — I promise, you can put together all the food you need for a small holiday gathering in 2 hours! Seafood: Seafood cooks quickly, is loaded with omega 3s and protein, and is a crowd favorite. 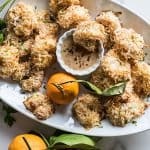 Try these Crispy Baked Coconut Shrimp, or go even easier by serving shrimp cocktail. Nuts: For this party spread, I roasted my own nuts with some herbs and spices – I will be sharing a recipe for Holiday Spiced Mixed Nuts later this week! I prefer to buy raw nuts, and roast them myself, because then I can be sure they are roasted in a healthy oil and are lightly salted – but buying them pre roasted is definitely a time saver! Fruit: Buying fruit that doesn’t need to be prepared is a great way to add healthy food that is perfect for snacking on with wine. Grapes and mandarin oranges are perfect for the winter season. Popcorn: Skip the chips, and serve a bowl of buttered popcorn. I like to pop it on the stove top with olive oil and a little butter, lots of sea salt, and some italian herbs. When I serve popcorn, the bowl is always empty mid-party. Make it Gluten Free: Instead of buying store bought breadcrumbs, I make my own gluten free coating by grinding up Brown Rice Crisp cereal – it’s the perfect light texture! 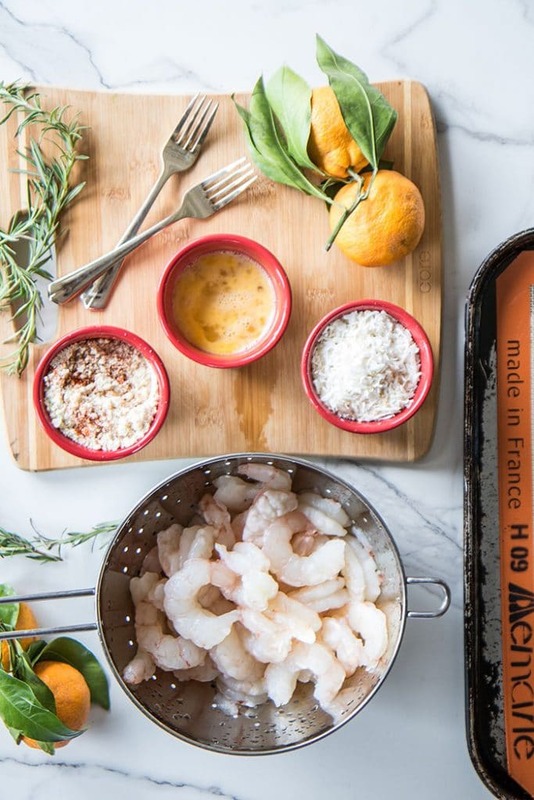 Make it Ahead: You’ll want to bake the coconut shrimp right at the start of the party. It only takes 12-15 minutes to bake, and it’s best when still warm and crispy. To prepare it ahead of time, make the breadcrumb/coconut coating, and beat some eggs. If all your other party food is prepared ahead of time, coating the shrimp and throwing them in the oven won’t take too my time! 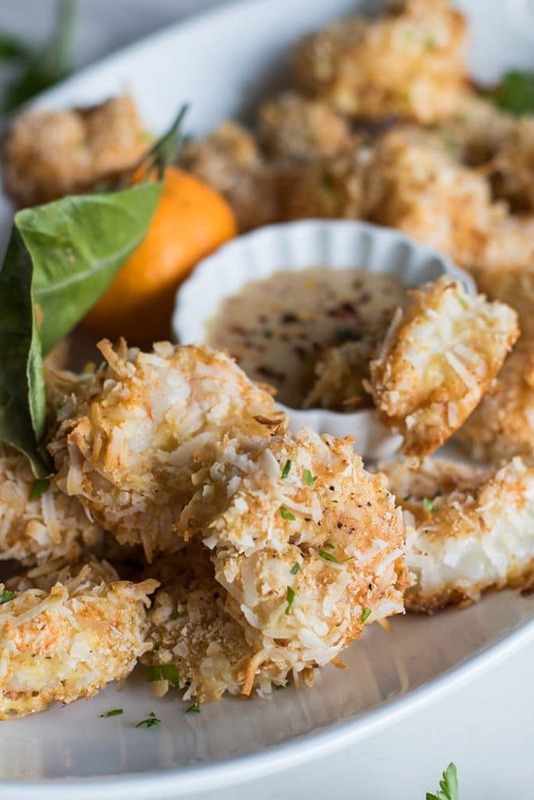 This healthier baked version of Coconut Shrimp is a party favorite. This is gluten free, made with homemade gluten free "bread crumbs," and served with a homemade Chili Orange Dipping Sauce. Serve with a store bought cocktail sauce or sweet Thai chili sauce to save time. Preheat oven to 425 degrees F. Line a large baking tray with baking paper or a Silpat. If neither of these options are available, generously grease the pan with olive oil. If shrimp aren't defrosted yet, add to a strainer and run under cool water for 5-10 minutes to thaw quickly. In one bowl, mix together the "flour" ingredients. In another bowl, beat the eggs. In a 3rd bowl, add together the ingredients for the coconut mixture. Take shrimp one at a time and dip into the flour mixture, then into the eggs, and then into the coconut mixture. Place onto the baking tray, leaving space around each shrimp so the hot air can circulate around them and brown them all the way around. Lightly spray the coated shrimp with an olive oil spray. Once all the shrimp are coated, bake for 12-15 minutes. Around the 10 minute mark, begin monitoring the shrimp. The coconut will go from nicely browned to burnt rather quickly, and all ovens are different. If you'd like to prepare these ahead of time for a party, prepare the 3 bowls (flour, eggs, coconut mixture), and be sure you have your dipping sauce made ahead of time. These can be coated in 5 minutes and baked just as your guests are arriving. It's best to serve these still warm while they are extra crispy. I don't recommend baking these and then reheating - I have tried re-baking the leftovers, and they weren't nearly as good as they were the first day. This sounds totally yummy. Love shrimp and coconut together. Sounds so tropical. Absolutely! And when it's cold and dark out, I crave tropical flavors. I love coconut shrimp and so does everyone in my family. They will be so happy to have this recipe for the holidays - especially gluten-free.That sparkling one looks perfect for a party or just end of the day, lol. It's so nice to have something fresh and light to accompany holiday entertaining. Beautiful, Michelle - thanks! Robyn, yes, it is great to have gluten free options for parties that are just as delicious as the regular thing -- inclusive holiday menus :) This sparkling is great! 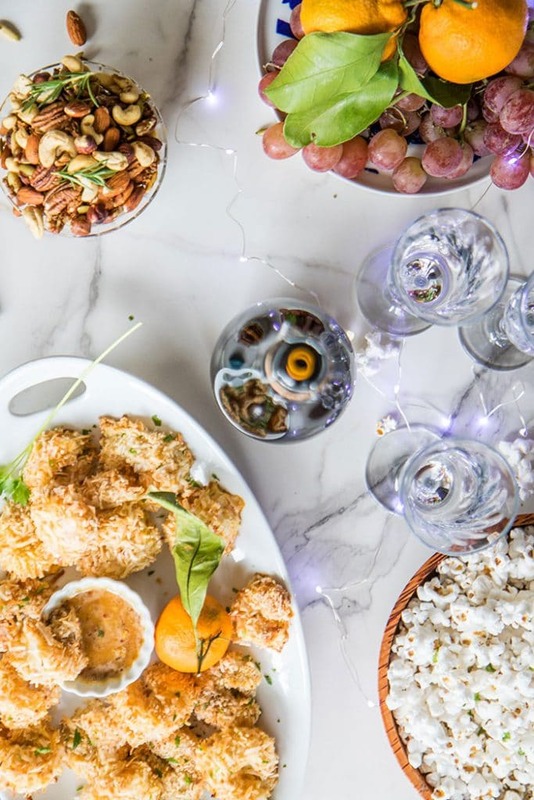 Yes, yes I'm ready for all the festivities December brings - and all the appetizer parties with snacks like these! These sound fabu! I love this type of holiday entertaining -- it's fun and festive, but also feels effortless. I'll look for this prosecco. Yum! Coconut and shrimp goes so well together. Thank you for all these brilliant tips. They are very timely as I am throwing a party this weekend. 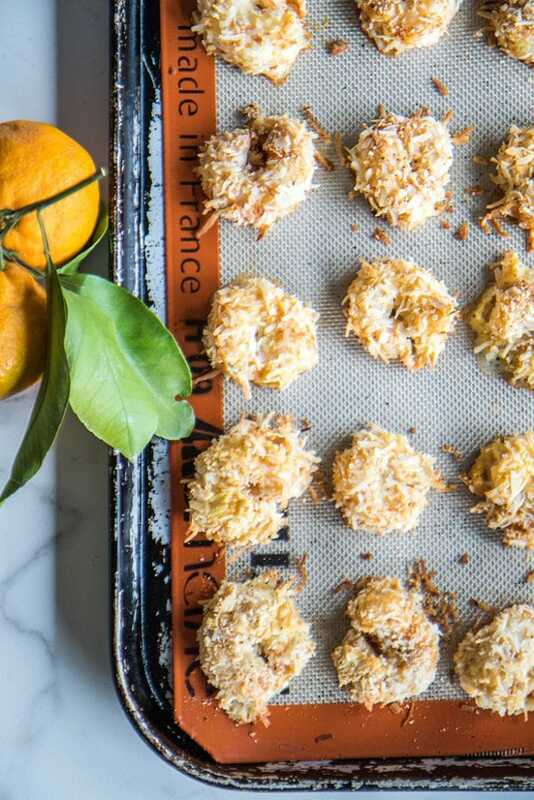 Also, would love to try these crispy baked coconut shrimps. They look really good plus my personal belief -- one can never go wrong with shrimps. Wow Sheila, thanks for letting me know :) Exactly -- you certainly can never go wrong with serving shrimp at a party. Guaranteed to go fast! I have another delicious shrimp appetizer I will be sharing next week! I love that picture! Hope you enjoy these as much as we do! its realy pleasure to read your post. thank you so nuch for wrting such a nice post.